Microsoft has revealed some details of a forthcoming service that will allow Windows Mobile users to synchronize information between their phone and the Web. The service, called My Phone, will provide a place to store data such as photos, videos, text messages and calendar items. Users will then be able to share that data with others or use the service as a way to back up information on their phone. A description of My Phone appeared earlier Friday at getskybox.com, but Microsoft pulled the site after several blogs wrote stories about it. Getskybox.com now redirects to a new URL that has much of the same description. 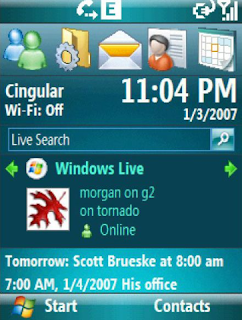 Getskybox.com went live earlier than planned, and Microsoft will offer more details about My Phone at the Mobile World Congress trade show in mid-February, said a Microsoft spokesman. The service will be available at that time as a limited, invitation-only beta, he said. Microsoft already has a service that does something similar to My Phone. Live Mesh lets people upload photos and other information to a Web page and access the data from a mobile phone. But My Phone may be different because it will automatically synch a wide array of information from phones. In addition, while anyone with a phone and a browser can use Live Mesh, My Phone will be limited to people using phones with Windows Mobile 6.